No matter who you are or where you are on the spiritual journey, you are welcome and honored here. Our table and hearts are open to all who come because we believe that there are no outsiders in God’s commonwealth of justice and compassion. Here we experience Christ risen among us through sharing one another’s joys and burdens and living the Good News of unconditional love for all. We go forth from this place nourished for the journey and ready to bear this love for the healing of the world. All Souls Parish is a Christ-centered community that unites around core beliefs of the welcome of strangers, inclusion of spiritual inquirers from every background, and the calling of all Christians to be the body of Christ in the world. We are old, young, and every age between. We are straight, gay, single, coupled, married with children, divorced, widowed. Some of us were raised within the Anglican Communion; many others found their ways to All Souls from Catholicism, other Protestant denominations, Judaism, or the pull of spiritual searching. We celebrate these differences, rather than tolerating them, believing that all are equally loved as God’s children. We rely on inspired preaching and careful teaching to help us learn the lessons of the Gospel and the traditions of the Episcopal Church. Together we celebrate, grieve, work, study, suffer, laugh, and love. 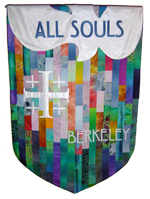 The spirit of inclusiveness follows from worship and liturgy at All Souls where we blend elements from Christianity’s 2000-year history with contemporary forms. Familiar hymns and other traditional sacred music are interspersed with gospel songs, Taize chants, and folk hymns – we love to sing. We practice open communion, welcoming all who seek Christ to join us in the sacrament. As a faith community, All Souls fully embraces the concept of “the priesthood of all believers.” We rely on strong lay leadership as well as our staff and associate clergy to shape our life together. Our monthly Open Door Dinner to feed the hungry is our largest, but not our only, effort to live into our Baptismal Covenant by caring for those outside our church. Children and youth are accepted as full members of the church in worship, at communion, in teaching, and at play. They are not only the future of the church; they are equally the body of Christ now. 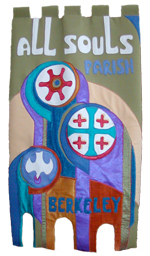 We are a parish of the Episcopal Diocese of California, which began its ministry at the time of the Gold Rush in 1850 and stretches from Los Altos to Novato to the south and west and Brentwood to Livermore to the east. There are 80 congregations across the Bay Area in the Diocese of California serving urban, suburban and rural areas. Our common mission is guided by our Bishop, the Rt. Rev. Marc Andrus (the word “episcopal” comes from the Greek word for bishop), and finds its voice in diverse settings, in many languages and with tens of thousands of Christians every week. Our diocese is one of over one hundred other dioceses that make up the Episcopal Church in this country and 15 others, representing over 2.4 million members, led by our Presiding Bishop, the Most Rev. Michael Curry. There has been an Episcopal presence in the United States since its inception, with the Rt. Rev. William White, Episcopal Bishop of Pennsylvania, serving as the Chaplain to the Constitutional Convention in 1787. We trace our roots further back to the Church of England and are members of the Anglican Communion, connecting us globally with over 80-million followers and offering perspective and partnership with Christians on every continent.